Hello, everyone, and welcome back to 205 Live being on Tuesdays. First things first—an apology once again for not being able to come out with a column last week. No real excuses here, but I'm back. Color me a little surprised that Cedric Alexander lost to Hideo Itami, because now we're back to Cedric not being in the championship picture when I was expecting him to figure in the title match at Royal Rumble. Looks like it isn't much of a story as we didn't hear from Cedric on this week's episode; where he goes from here is anyone's guess. So, yes, 205 Live is back on Tuesday nights now. The rumors say it's because Vince McMahon wants more live programming on the WWE Network, for whatever reason, but I seriously don't think there's much of a difference whether the show that comes on right after SmackDown Live is live on the Network or not. Not everyone is going to watch 205 Live in that particular timeslot. I mean, isn't that the beauty of on-demand programming? I'm never going to watch the shows on the times they're on because of my daily life! And you can tell the switch back to airing live after SmackDown takes an immediate toll on the show's quality. The crowd is absolutely dead for this, no matter how good Lio Rush, Lince Dorado, Buddy Murphy, and the debuting Humberto Carrillo are. The background audio from the past few months has proven that the best time for 205 Live is right before SmackDown, and to insist on this backward setup is to do your hardworking cruiserweights dirty. Just imagine if a warmer crowd were to witness the debut of Humberto Carrillo, a guy who wasn't given the most exposure back in NXT. Perhaps they would've been more alive and appreciative of his graceful high-flying, and the call-up wouldn't have seemed like a dud. Sometimes I wonder if they forget a good crowd can raise the profile of a show. At the very least, they're interested in injecting 205 Live with some new blood. I still think one of the NXT UK cruiserweights should've taken the open challenge spot, but going from the way Carrillo moves in the ring, I think he'll be all right. It's up to the show's heels now to build up their babyface counterparts the best they can. He's no Mustafa Ali, but then again, who is? Plus points for remembering that Lince Dorado is the hot-headed luchador of the House Party. It goes a long way in making sure he and Gran Metalik aren't just Kalisto's sidekicks, even if it seems that way a lot of the time. Vic, that was a back kick, not a crescent kick. They worked extra hard on the final minutes of that match, and it felt like it was all for naught thanks to that dead crowd. I feel really sad for Tony Nese. The guy's been on such a start-and-stop ride for the past month or two that it's almost criminal for him to have to lose to Noam Dar after managing to shut down Cedric Alexander last November. I get that Noam's hot product right now, but isn't it weird that Buddy Murphy's training partner isn't as good as he is? The Smarkometrics Experience Xtreme is back! How does the division stack up with the addition of Humberto Carrillo? Buddy Murphy (no movement) — Murphy isn't afraid of new challengers, proving why he's the Cruiserweight Champion in his successful open challenge. Hideo Itami and Ariya Daivari (#7 last week) — Itami has some good momentum on his side after beating Cedric Alexander to qualify for the Fatal Four-Way at Royal Rumble. Lucha House Party (no movement) — Lucha House Party takes the L from Lio Rush, but thankfully their RAW presence makes up for that. Lio Rush (#3 last week) — The Man of the Hour manages to advance one spot thanks to the victory against Lince Dorado, but his charge Bobby Lashley's Intercontinental Championship win is no small feat either. Akira Tozawa and Brian Kendrick (#2 last week) — Not around this week, but hey, they're still a thing for next week. Noam Dar (#10 last week) — Noam Dar pulled out a timely victory against Tony Nese last week, and the guy's been chasing him for a rematch. Cedric Alexander (#4 last week) — Terrible luck right now with the loss to Hideo Itami. How will the former Cruiserweight Champion rebound from this? Humberto Carrillo (new) — The young lion from Mexico impressed in his first 205 Live outing (even if it didn't sound like it). How will he fit into the cruiserweight division moving forward? Tony Nese (no movement) — The only reason Nese isn't at #10 right now is because he's not Drew Gulak. Or TJP. 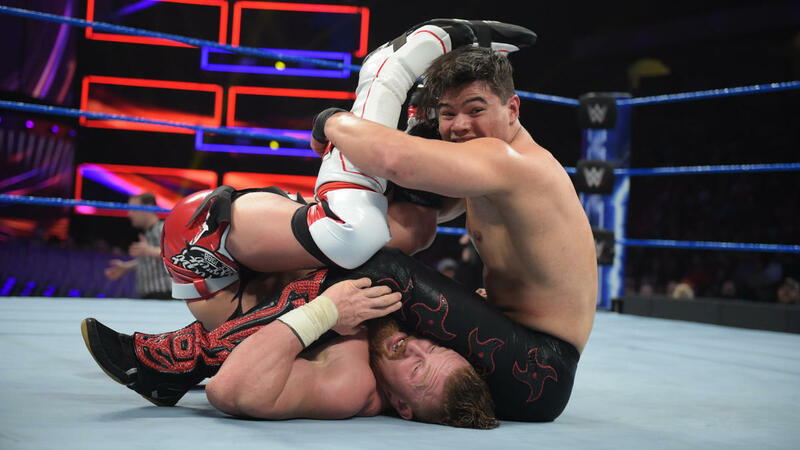 TJP (no movement) — Is at least present this week to, uh, make his presence felt by Drake Maverick.